Could this be the announcement of they mytical Apple tablet we've been hearing so much about? I've already picked it as my favorite gadget of 2009, even though the tablet doesn't officially exist yet. In 2010, I'm looking forward to the thing, however. It'll be the gadget that finally gets me to sit on the couch and surf the Web. It'll be the gadget that finally gets me to read e-books, thanks to its revolutionary e-ink/LCD/OLED/Smuckers Grape Jelly technology. I plan to be simply blown away by the device. Joking aside, rumors have been swirling, flying and hovering, the latest indicating that Apple has asked a number of iPhone application developers to revise their programs for a larger screen device by sometime next month. The upcoming event will reportedly be held at the Yerba Buena Center for the Arts — the site of the company's iPod-centric music events held every year in the fall. It seems Apple doesn't need a Macworld event to make its announcements after all! COMMENTARY: Steve Jobs is the face of Apple, and he is a master at building marketing buzz, creating anticipation and raising Apple evangelist expectations to a fever pitch. Whenever a new Apple product comes out, Steve personally announces it, and makes a huge production out of it, as thousands gather before him, applauding his every word. I would find it unimaginable that Steve Jobs would not break the Apple tablet announcement without a lot of fanfare. Product releases are always announced by Steve at MacWorld, the center of the universe and Mecca for Apple evangelists, and I don't believe this is going to change. MacWorld Expo 2010, originally scheduled for the first week of January has been moved to February 9 through 14. Did Steve convince the MacWorld event sponsors to move the event to give him time to finish the Apple tablet? This would not surprise me. It would also not surprise me that Apple new product designers and engineers are camped out in Cupertino, working day and night, to develop a go-to-market commercial version of the rumored Apple tablet, so that it is ready for MacWorld. Steve's loyal followers come from around the globe to worship the Supreme Apple God. All the bad things that have ever been written about Steve Job, including his uncontrollable temper, demand for absolute perfection, and stories of being "steved" (personally fired by Steve), are all forgiven. Steve beat pancreatic cancer, no wonder he is looked upon like an immortal God. I truly expect that the rumored January announcement is just a ruse to keep the media and competitors off-balance and increase expectations and excitement to a fever pitch. I fully expect a pilgrimage to MacWorld. How can I miss the event of the ages, and an opportunity to be personally baptized, sprinkled with gold dust and given an opportunity to kiss the hand of his holiness, the immortal Steve Jobs. He Lives!!. • 2010 is the year when we can stop talking about social media as a "phenomenon" and agree it is the new status quo. Teens have known this for awhile. • Teens will join the general migration from MySpace to Facebook ... even as we hear more and more about people who are "closing" their Facebook accounts. • New FTC regulations with respect to social media will emerge; what they achieve, TBD. Ironically, new privacy restrictions may mostly serve to keep parents in the dark regarding teen accounts. • Social search will start to come of age ... this is particularly relevant for the teen set, which leans heavily on peer opinion when thinking about brands and products. Leading marketers will figure out how to use this peer influence to deliver their marketing messages. • Social media marketing, as part of integrated, thoughtful campaigns, will achieve measurable success with multiple segments, including teens ... in particular look for Facebook to deliver results to advertisers via key word targeting, pay-per -click models, etc. • Expect the teen / tween segment to have their hands on increasing numbers of smartphones -- especially the iPhone. • More smart phones might just be a boon for parents: with LBS (location based services), parents can more easily keep tabs on their kids' whereabouts. • Cool, functional apps will continue to emerge--- in particular those that that allow for one to many updates and notifications. Marketers, think about what this means for you. • Mobile advertising: in 2010, don't expect everyone to "get it right" -- this will take a few more years. Teens are particularly wary of anything that smells like advertising so getting it right for this segment is even tougher. However, marketers will take advantage of smartphones' HTML browsers and a handful of effective advertising campaigns on mobile devices will emerge. • The line between mobile and non-mobile won't be gone by the end of 2010 -- but almost. • Despite the rise of the smartphone, SMS will remain the killer app for teens. • Teen email, however, will continue its slide down the communication ladder. • Talking on the telephone? It still happens, but teens are much more likely to connect with their fingers than via their voices. They'll IM before they call. Even more so in 2010. That's good for online marketers. • Twitter will continue to grow, but teen usage will continue to lag -- it's just not relevant to their world -- yet. • Online advertising will get a lift. Print publications are decreasing, teen readers of print are an even smaller, more rapidly shrinking segment. TV viewership is fragmented. Marketers have to take their messages online in greater numbers with greater dollars. • Integrated campaigns that cross technology channels (social media, mobile, movie, etc.) with compelling "calls to action" will be most effective. • Content and marketing will continue to blend. The most compelling campaigns will be clever, topical and provide clear value to teens (and, therefore, marketers). • Unpaid exposure -- via viral marketing, etc., will continue to grow, becoming an even more important factor in branding. The online advertising question, then, is how to drive this viral branding. • Twilight will continue to occupy huge mindshare in the teen (girl) world. With a new movie due out early summer, I don't expect this to change until year end. The question: who/ how can best capitalize on this success from a marketing standpoint? I have often been asked if there is going to be a second real estate bubble, as if I had some profound knowledge and could see into the distant future. Surely, the worst is behind us and nothing could be worst than all those sub-prime loans that ignited the first real estate bubble in 2005. Unfortunately, the real estate bubble started slowly and went relatively unnoticed. By 2007, the real estate bubble had picked up steam, and by the end of the year, the economy also went into recession. According to some economists, the current recession is officially over and they point to an improvement in housing sales as an indicator. You ask any Wall Street broker or expert on the markets, and I have never seen them more bullish on the U.S. economy, if the rise in the Dow and stocks is proof positive. Banks and real estate brokers hail the drop in real estate loan rates as another indicator. So the recession must be over, right? Ask the 22.5 million Americans that are either unemployed or under-employed and they will tell you that the recession is not over for them. I look at a different measuring stick. One of these is the huge deficits being sustained by 42 out of 50 states. Many of these states, including my home state of California, are already projecting increasing budget deficits, in spite of the Obama Stimulus Plan. This is happening to both blue and red states. There a few exceptions, but even those states are making plans to layoff government workers. The states see a bleak future, and learned from the Fed that unemployment rates are predicted to remain high (8-10%) for the next two to three years and that property tax collections will continue to decline due to a decline in property values. The states have had no choice, but layoff employees in huge numbers. The actions states have taken signals their lack of confidence in the stabilization and increase in real estate values. To many states, real estate values have not bottomed out yet. Another indicator that I look at is the banks themselves. These are the ones that caused the financial meltdown in the first place, and got us into the terrible mess we are now in. The OBama Stimulus Plan was supposed to stimulate the economy. The Feds reasoned that if dollars were poured into the banks, they would be prompted to lend money to small businesses, the biggest job creators, and this would create new jobs or re-hire those that were previously laid-off. As it turns out, the banks have turned risk aversive at a time we need them the most, and are doing very little lending. Many are using the money to buy competitors weakened by the recession and financial meltdown. Examples include acquisitions by Bank of America (acquired Merrill Lynch), Wells Fargo (acquired Wachovia) and Chase Bank (acquired Washington Mutual. Instead of creating jobs, the banks have increased unemployment, by laying off employees from the acquired banks. They call this streamlining or eliminating duplication of effort. The banks reason that these acquisitions will give them a competitive advantage when the economy turns around. So the questions remains, will there be a second real estate bubble. The quick answer is, It depends. Being the inquisitive, type A personality, educated and quick learner on my topics, I did some research on this very question and what I discovered sends shivers up my spine. It turns out that there are some alarming trends that are a lot more sinister going on in the real estate mortgatge markets than I ever imagined, and this prompted me to write this article. "The single largest impediment to a recovery in the housing market is the large number of loans that are either in delinquent status or in foreclosure that are destined to liquidate. This creates a huge shadow inventory. We estimate this housing overhang at 7 million units, 135% of a full year of existing home sales." I have learned that every business plan should include an executive summary with a some kind of a bold statement. Well, Amherst Securities Group sure outdid themselves. That's one bold statement. And after reading their report, and researching other data on the housing market, I came to the same conslusion as Amherst. That's the shivering spine that I mentioned earlier. According to Amherst, the apparent stabilization of home prices and the increase in new and existing home sales, is only temporary, and has led many investors to believe the housing market has bottomed, and is beginning to recover. Amherst believes this optimism is premature, while acknowledging there are a lot of positives in the market--prices have fallen significantly and housing is more affordable that at any point over the past 2 decades, and the national median price increased a couple of grand. The Obama administration's $8,000 tax credit for new home buyers pumped up sales (increased sales to first-time buyers by 10.1%) in the fourth quarter, and expired at the end of November. The U.S. Senate recently voted to renew the credit for the first six months of next year. The Federal "Cash For Clunker's" program, that allowed U.S. automobile dealer's to offer auto buyers between $2,000 and $4,000 for a trade-in regardless of condition, caused a temporary increase in U.S. auto sales, but the program ran out of money in November, and has not been renewed. I fear that the the renewal of the $8,000 tax credit will temporarily boost sales of homes to first time buyers, but the tight credit standards of banks and potential for an increase in home prices resulting from the program, may only be temporary. What happens when the $8,000 tax credit expires at the end of June 2010, at the height of the home buying season? What intrigued me about the Amherst report was their use of the "housing overhang" and "shadow inventory" of 7 million units. As you read their report, you realize that what they are talking about is the problem that "hangs" over the U.S. real estate market and hidden inventory of real estate inventory, the "shadow ", that the mortgage and banking markets have overlooked. Amherst states, "BOTTOM LINE--Loans continue to transition into the delinquincy/foreclosure pipeleine at a rapid pace, but are moving out at a very slow pace. That housing overhang is the single largest impediment to a recovery in the housing market." Amherst used The Mortgage Bankers Association"s (MBA) Quarterly Delinquency Survey which represents 44.7 million housing units, or approximately 80% of the 55.9 million homes in the U.S. The shadow inventory is calculated by multiplying the 55.9 million homes by 12.42% (see above). This results in a U.S. shadow inventory of 6,942,780 or nearly 7 million homes, which is equivalent to 1.35x the existing home sales of 5.2 million units. You will find the calculations on page 2 of the Amherst report. Not all regions of the U.S. have been affected in the same way by the real estate bubble, so Amherst calculated the shadow inventory for Riverside, California to make a dramatic point. Amherst determined that the shadow inventory for Riverside was 7,010 or 20% of all properties (34,800 units) in that city and was equivalent to 5 times the number of units listed "for sale" or 1,372 units. The Amherst report includes a table listing data for the top 20 largest real estate markets that calculates the shadow inventory for each market. The highest shadow inventory was Las Vegas with a shadow inventory 4.15 times the "for sale" listings. The lowest of the top 20 was New York with a shadow inventory of 1.04 times the "for sale" listings. Las Vegas, San Diego, Los Angeles, San Francisco and Phoenix were the top 5 with shadow inventories of 4.15X, 3.39X, 2.89X, 2.79X and 2.77X respectively. This gave me another shiver. Increasing default or transition rates - Amherst considers a loan in default when it becomes >=60 days delinquent as the loan has only a small chance of recoveirng. According to Amherst, loans are moving from current to default at a much faster rate, the transition rate. Amherst also states that many investors rely on delinquency/foreclosure data from 18-24 months ago, and are making a mistake by ignoring more current information, and this overstates their yields or return on investment. Amherst supplies several graphs to visually measure the transition rates for prime, Alt-A, subprime and Option ARM mortgates. Very interesting stuff. Cure rates are increasingly getting lower - The cure rate, or percentage of loans in default that are brought current, has decreased from 66% in 2005 to only 5% in Q2 2009. That's scary. According to Amherst, cure rates are low because homeowners are stretched financially, one out of every five families has an unemployed bread earner, and there is no economic incentive or ability to cure their mortgages, as they have negative equity or "under water". Many borrowers simply walk away from their mortgage obligations and let the bank foreclose and take over the property. Liquidation timelines are becoming lengthier - The lengtening of time between the last payment and liquidation include foreclosure moratoriums (federal and statewide), longer waiting periods prior to Notice of Default and between the Notice of Default and the Trustee Sale, and a slowing of the judicial process in judicial states (where court approval is required to foreclose). In addition, new rules requiring that each loan be tested to see if the borrower can qualify for a modification can tack on additional time. According to Amherst, loan modifications are temporary fixes, because approximately 70% of loan modifications fail, and the property eventually goes into foreclosure. Housing prices are themselves seasonal - Spring and early summer are generally stronger than late summer, fall and water. We are now entering the "slow" period so home prices will begin to decline. Home sales are highly seasonal yet liquidation volumes are not - The liquidation sales constitute a far higher percentage of winter home sales than of summer home sales. Amherst provides numerous formulas, tables and graphs to explain and amplify the housing overhang and shadow inventory, and you may have to read the 17-page report several times, like I did, in order to understand their analysis. I summarized their findings in order to keep things concise and simple to understand. 3rd Quarter 2009 foreclosures there were 937,840. This is an increase of 5.40% from the 2nd quarter 2009 and an increase of 22.5% from the same quarter 2008. The seasonality factor is really starting to kick in. Refer to: http://www.realtytrac.com/foreclosure/foreclosure-rates.html. Foreclosures are not just sub-primes mortages, but prime and fixed rate prime loans. MBA forecasts foreclosures to peak at the end of 2010, and Chief Economist Jay Brinkmann stated in their "Q2 2009 National Delinquency Survey", "The problem is moving to prime loans, and fixed rate prime loans. Although the delinquency rate is lower for prime fixed rate than for other loans, these loans make up 65.5% of all loans--so the increase matters." The MBA Q2 2009 data shows about 5.8 million loans delinquent or in the foreclosure process nationwide. MBA provides some very eye-opening graphs that provides backup for their dim forecast. Refer to: http://www.calculatedriskblog.com/2009/08/mba-forecasts-foreclosures-to-peak-at.html. COMMENTARY: In order to gain the full benefit of what I have just written, you will have to read or review a lot of very boring material. There are no shortcuts. It took me a couple of days. If you are an investor, you should definitely read this material. Some of you will strictly view the potential for a second real estate bubble as a "financial opportunity". I refer to those individuals as "sharpies" because their head comes to a very sharp point, in the shape of a dunce cap, if you will. They are the second wave of real estate speculators, the ones that got over extended due to all that cheap money, drove us into the ground in the first place, and lost everything during the first real estate bubble. I know several of them. I welcome your feedback. Challenge me if you wish, but read the Amherst report before you do. Dec. 30 (Bloomberg) -- In a holiday season when retailers crawled back from last year’s record decline, three U.S. clothing chains stood out as winners. Aeropostale Inc.,Nordstrom Inc. and Kohl’s Corp. promoted lower prices on specific merchandise and managed inventory to outpace industry sales in November. They will probably say next week those gains continued in December, according to Liz Dunn, an analyst at Thomas Weisel Partners LLC in New York. Teen retailer Aeropostale boosted sales by offering $10 hooded sweatshirts for two hours on Black Friday, the biggest shopping day of the year. By contrast, Abercrombie & Fitch Co.’s main holiday promotion was a $25 gift card on $100 in purchases, more than customers were willing to spend, said Thomas Weisel’s Dunn. Nordstrom made fewer cuts to inventory to capture more revenue than Saks Inc., the luxury retailer that reported a 26 percent drop in November same-store sales. Consumer confidence improved for a second month in December, from a record low in February after unemployment and cratering home values led to a freeze in spending. Retailers’ sales may increase as much as 3.5 percent next year, the International Council of Shopping Centers forecast yesterday. Aeropostale’s sales for the day of the sweatshirt promotion and the following Saturday rose 10 percent from a year earlier at comparable stores and gross margins, a measure of profitability, also increased, the New York-based company said. “Our success this year has come from focusing on the right gift items and balancing fashion and value,” President Mindy Meads, 57, who will become co-chief executive officer next month, said in a telephone interview. Abercrombie & Fitch’s gift-card offer, which started Nov. 24, is the promotion on which Abercrombie has focused the most, said Eric Cerny, a spokesman for the New Albany, Ohio-based company. He declined to comment on its results. Aeropostale, Nordstrom and Kohl’s sell basic clothes like sweaters, coats, boots and pajamas that have topped consumers’ gift lists in the economic slowdown, according to retail analysts. Shoppers planned to purchase those items because they are practical, according to a survey conducted last month by the ICSC, a New York-based trade group. Wal-Mart Stores Inc., the world’s biggest retailer, was among retailers to come out early with discounts. The Bentonville, Arkansas-based company said on Sept. 30 it cut prices on more than 100 toys to $10 or less to “kick off holiday shopping.” The company doesn’t report monthly same- store sales and has forecast sales may rise as much as 1 percent for the 13 weeks ending Jan. 29. While retailers focused on promotions, they also reduced inventory to avoid the markdowns of as much as 80 percent they had to make on leftover merchandise last year. Saks may have cut too deeply and missed out on sales, said Craig Johnson, president of New Canaan, Connecticut-based consulting firm Customer Growth Partners LLC. Nordstrom’s inventory fell 6.7 percent as of Oct. 31, compared with a 21 percent drop at Saks. Nordstrom may also report an increase in fourth-quarter gross margin, Barbara Wyckoff, an analyst at Jesup & Lamont in New York, said in a Dec. 18 note. She recommends buying Nordstrom shares. “We’ve been encouraged by our sales results,” said Colin Johnson, a spokesman at Seattle-based Nordstrom. Saks is comfortable with its inventory levels, said Julia Bentley, a spokeswoman. The cuts helped the company post a profit in the third quarter, compared with a year-earlier loss. The 30-member Standard & Poor’s 500 Retailing Index has gained 50 percent this year as improving consumer sentiment helped chains. Nordstrom’s stock almost tripled, outpacing Saks’s 58 percent rise this year. Aeropostale more than doubled, compared with Abercrombie & Fitch’s 54 percent gain. Kohl’s, based in Menomonee Falls, Wisconsin, increased 53 percent. Kohl’s has taken market share from department-store chains including J.C. Penney Co. by offering a range of apparel, housewares, electronics and jewelry at better prices, said Abella, the investor at Rochdale Investment Management. J.C. Penney was encouraged by stronger shopper traffic trends at the malls over the holidays, particularly in response to its promotions, said Darcie Brossart, a company spokeswoman. December same-same sales at Kohl's may rise 2 percent, compared with a 4 percent drop by Plano, Texas-based J.C. Penney, according to estimates from Thomas Weisel’s Dunn. In November, Kohl’s sales advanced 3.3 percent, topping analysts’ estimates, while J.C. Penney reported a 5.9 percent decline. COMMENTARY: Although I hate to shop, Aeropostale Inc.,Nordstrom Inc. and Kohl’s Corp are three of my favorite retailer's, although Nordstrom's piano music player is a bit too much for me. I much prefer jazz. Kohl's took the advantage of the recession, buying up many of the now defunct Mervyn's store properties at bargain basement prices. A risky proposition, but they apparently have the right marketing and inventory management strategies in place. Aeropostale, Inc., is a big hit with today's Millennial's and it is hard to find one of these youngun's that doesn't shop there. Nordstrom's has always prided itself by offering great customer service and quality merchandise. If you are looking for discounted prices, forget Nordstrom's, but their formula for success cannot be beat. Will Apple be the Google of mobile app search? A new report from investment firm Broadpoint AmTech suggests the iPhone-maker has an opportunity to monetize the search process for applications as the number of apps balloons and discovery becomes more difficult. "We do not think it is inconceivable for Apple to consider entering the "App" search business," states the report by Broadpoint analyst Ben Schachter, which looks more broadly at the impact of apps on mobile search. It maintains that apps pose a potential threat to established search players because they allow users to bypass the traditional search box to go right to the source for information. So a mobile user might turn to the Amazon app for production information or the Fandango app for movie listings, instead of Google or another search engine. "If users get in the habit of using Apps to access the desired information or service, search engine traffic and query volumes for the established search engines/portals could be negatively affected," according to the report. Schachter also points out that commercial and product-related searches, which are among the most lucrative queries because they signal purchase intent, are also the most at risk of being lost. That's because more and more apps are geared solely to providing product information or catalog displays, while others employ GPS navigation and barcode readers to help users find the best deals in a local area or enhance in-store shopping. Apps are also increasingly powering mobile commerce. In the most prominent example, eBay has said it expects to sell $500 million worth of merchandise via its mobile app this year. Where Google and Yahoo have become a key part of the typical research and shopping process online, the emergence of e-commerce apps in mobile may disrupt that pattern, leading to fewer product queries. The increasing ability of smartphone owners to populate device "decks" with their favorite apps will only hasten the shift away from using the search box as a shopping starting point. In that sense, Google is laying the seeds of its own destruction by creating an open mobile operating system like Android. At the same time, through Android and the upcoming launch of its own mobile phone, Google is focused on increasing mobile Web use while extending its Internet-based business model. The importance of mobile apps has not been lost on the search giant, either -- its Android Market now boasts some 20,000 titles. That total is still well shy of the more than 100,000 in the iTunes App Store. But exactly how Apple might build on its big app advantage to enter the search business, the report doesn't spell out. Rather than starting its own app search operation, it suggests the company is more likely to partner with an established search engine in a revenue-sharing deal. Google already powers search on the iPhone browser through an agreement in which Apple is believed to get the majority of ad revenue. But the more Apple perceives Google to be a direct competitor in smartphones, the less likely it may be to ally with Google on mobile ventures over time. COMMENTARY: If you ask me, there are too damn many apps, with probably less than 20% of app developers making money off of their apps, and I bet less than 10% of those are making serious money. If more consumers are using branded search apps to do their online shopping and price comparisons, and if regular search engines like Google, Bing and Yahoo are going to experience noticeable drops in consumer product searches, it makes sense to find creative ways to monetize those apps. I don't mind this, so long as the app developer gets his cut of those revenues. Andrew Levine knew he wouldn't find a job in investment banking when he graduated with an M.B.A. from the University of Miami in 2008. Wall Street was in the midst of a financial collapse. So instead the 24-year-old focused his efforts on launching a start-up. "I figured that starting my own company was the best use of my time while I waited for the market to thaw," says Mr. Levine. Faced with an unemployment rate of 16% for 20- to 24-year-olds, a growing number of recent college and grad-school graduates are launching their own companies, according to anecdotal evidence from colleges, universities and entrepreneurship programs around the U.S.
For his part, Mr. Levine built upon a business plan for a niche social-networking company he had created for an entrepreneurship class the prior year. He showed the plan to the father of a college friend who was an angel investor and got $40,000 in seed money in exchange for an equity stake in the business. Armed with start-up cash, Mr. Levine created audimated.com, an online social-networking site for musicians and their followers. It serves as a forum for the independent music community—both fans and musicians—to discover and promote new music. The site is in beta testing now with a launch expected in January. This push toward entrepreneurship among young people is likely to continue as employers plan to hire 7% fewer graduates from the class of 2010 than they hired from the class of 2009, which saw a nearly 22% drop in hiring from the class before, according to a recent report from National Association of Colleges and Employers. The annual average percentage of all job seekers starting their own businesses increased to 9% through the third quarter of 2009, according to Challenger, Gray and Christmas, a global outplacement consultancy. That's compared with 5% at the end of 2008. "Given the state of the economy, and the state of the job market, many young people are getting the push they needed to become entrepreneurs," says Bo Fishback, vice president of entrepreneurship at the Kauffman Foundation, a nonprofit that promotes entrepreneurs. "It's a lot easier to decide to launch your own company when there aren't a lot of jobs out there." School career-service officials say it makes sense for new grads to go the start-up route. Young adults are often well-suited to put up with the long hours start-ups demand. They don't have the responsibilities and financial obligations that burden older adults. What's more, these graduates grew up on the latest technology and easily adapt to technological improvements. Of course, young entrepreneurs also are likely to face their own hurdles. "Having the skill set to become an entrepreneur is different than any thing you learn in school," says Susan Amat, the executive director of the Launch Pad at the University of Miami, an entrepreneurship-support program based out of the campus career center. To that end, it's important for young entrepreneurs to seek the necessary help to get started. For current students or recent graduates, it might be easiest to reach out for assistance on campus. Many schools have campus incubators or offer start-up competitions, like Babson College's annual Entrepreneurship Forum, which offers cash, consulting, legal and Web services to winning business plans. Other schools have business incubators that help students—and sometimes outsiders—hone business ideas and, in some cases, support them financially or with other resources. Mr. Levine turned to the Launch Pad before he sought out an investor to him sharpen his business plan and investor presentation The program also gave him guidance for creating a revenue strategy and trademarking the site's logo. A boot-camp training program or organized group for aspiring business owners also can help. The Kauffman Foundation's FastTrac, a 10-week boot camp offered throughout the country, trains aspiring entrepreneurs. And Y Combinator of Mountain View, Calif., and TechStars in Boulder, Colo., offer cash and mentoring to young founders. The biggest challenge, though, might be convincing investors and customers that a young 20-something has the experience needed to deliver on a plan. One way to clear that hurdle is with strong advisers. "Recruit the right advisers who will vouch for you, who are experts in your field, will let you use their name and are beyond refute," says Mr. Fishback. Brooks Morgan, a 2009 graduate of University of Kansas, did just that. Mr. Morgan wanted to work in venture capital, but jobs were scarce, so he found work on the other side—at a start-up. As vice president of business development for Infegy, a start-up enterprise social-media analytics company, Mr. Morgan's first order of business was to attract advisers. His last two years in college, he had worked part-time with Richard Caruso, a venture capitalist , who introduced the three Infegy principals to people who could help them land deals with corporations. "Because we were passionate about what we were doing, [our advisers] were excited to be with and help the younger generation," says Mr. Morgan. Infegy was launched earlier this year and has 20 employees and several Fortune 500 clients. COMMENTARY: It doesn't surprise me that "twenty somethings" or Generation-Y's, disappointed with the unemployment situation, are forming their own startups. I call them the "I Want It Now" generation, because they are not patient enough to put in their time like their parents did. They got a taste of Mark Zuckerberg, and all of them want to become billionaires. I encounter a lot of Gen-Y's, and most have social networking sites, trying to become the "Next Facebook". They come to me looking for capital, but I have yet to find one that knocked my socks off. Even though I use social networking sites and believe in the potential for social media, I am not necessarily high on social networking sites from an investment angle, because I don't know of a single one, and I am talking Facebook, YouTube, MySpace and others, that have made a profit. Most of them rely solely on advertising, and I don't buy that you can make a profit solely from an ad-supported revenue model. That model is busted, and I am not the only one who thinks this. I wrote in a previous blog of the potential for a "Second Internet Bubble" and you are starting to see a lot of evidence of this already--industry consolidation, sites shutting down, less funding in the social networking sector. Just too much hype and not enough profits if you ask me. The incredible valuations for Facebook and Twitter, are kind of scary, and remind me of the last Dotcom Bubble. I try to encourage these youngsters to keep hammering away, and often provide some free advice and some pointers, but the social networking war is already won, and Facebook is declared the winner. However, even Facebook has not generated a profit yet. I keep hearing that they have 350 million members. Wow, that's impressive, but like I said before, where are the goddamn profits? I rest my case. Take a look at the designs for what could someday be the world's cheapest PC, and you may start to wish you were a third-grade child in Burundi. One Laptop Per Child (OLPC), MIT professor Nicholas Negroponte's non-profit effort aimed at putting cheap educational laptops into the hands of developing world schoolchildren, is working on an upgrade to its so-called XO computer, once known as the "hundred-dollar laptop." "I wanted to bring the One Laptop Per Child identity to life in this new form," says Yves Behar, founder of FuseProject, which designed the both the original and the XO-3. "That meant taking the visual complexity away, bringing tactility and friendliness, touch and color." Behar says he hopes to shrink the frame around the XO-3's display down to practically nothing, opting for a virtual keyboard instead of a physical one, and no buttons. The result, in his mock-ups, is a screen surrounded by only a thin green rubber gasket. "Nicholas [Negroponte] asked for something extremely simple and practically frameless," he says. "The media or content on the computer will be the prime visual element." In fact, that new form factor is just the beginning of OLPC's monstrous ambitions: It aims to make its tablet PC highly durable, all plastic, waterproof, half the thickness of an iPhone and use less than a watt of power, despite an 8-gigaherz processor. The price: an unprecedented $75. Many of OLPC's goals, to be fair, are more imagination than road map. And Negroponte has a history of overpromising. The original XO never hit its original goal of $100, (it currently sells for $172) and another touch screen upgrade to the XO that Negroponte announced in May 2008 was quietly scrapped this year based on costs. But in this case, Negroponte's plan has a twist: As OLPC assembles the components for its dream machine, it plans to open the architecture of the device to allow any other PC maker to take over the project. Negroponte is more interested in pressuring the industry to make cheaper, more education-focused PCs than he is in manufacturing any specific machine. "We don't necessarily need to build it," Negroponte told Forbes. "We just need to threaten to build it." Regardless of who puts their stamp on the ultra-cheap tablet, OLPC's biggest task may be getting the various components in line. A typical fragile, glass LCD screen hardly seems a wise choice in the hands of young children, or in countries with unpredictable and scarce electricity. 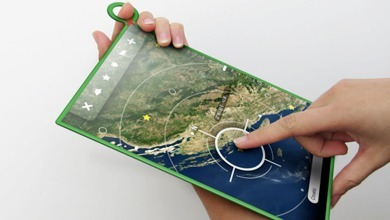 So OLPC hopes to incorporate plastic back-plane components, possibly from Mountain View, Calif.-based Plastic Logic, that would be far more durable. The tablet will also likely use ultra low-power screens from start-up Pixel Qi with both reflective and LCD capabilities, created by former Negroponte disciple Mary Lou Jepsen. If Behar's design comes to fruition, the XO-3 will feature a camera on the back of the device and a finger-hold ring on the computer's corner. That loop, a metal cable that runs from the device's rim and is encased in the same rubber as the screen frame, can be used to steady the computer in the user's hand or to let it hang at one's side. Magnets in the loop could also be used to keep it tucked behind the machine, out of the way. Those simple additions are the only departures from the tablet's minimalist design: Ideally, the machine won't even have a charging port. Behar says OLPC wants to use induction to wirelessly charge the battery through its rubber frame. "We wanted to remove all the scars that you typically see on a laptop from Lenovo or HP," he says. While the tablet isn't slated to appear until 2012, OLPC has other plans in the meantime. An incremental upgrade of the XO set for release in January will have several times the memory, storage and processing power of the current machine. The next upgrade, in 2011, will boost the machine's performance again and replace its AMD chip with a lower-power processor from phone chip maker Marvell. When it comes to his plans for the $75 dream tablet, however, Negroponte admits his track record of lofty promises doesn't offer much assurance that this latest fantasy machine will appear. But he warns the computer industry not to underestimate OLPC. "Sure, if I were a commercial entity coming to you for investment, and I'd made the projections I had in the past, you wouldn't invest again," he says. "But we're not a commercial operation. If we only achieve half of what we're setting out to do, it could have very big consequences." COMMENTARY: 2012, HUH? Talk about creating PR hype for a product that doesn't even exist yet. And, Mr. Negroponte says he doesn't have to build it, just threaten to build it. I am sure that Dell and HP are shaking (and laughing) in their boots. I like the idea behind OLPC, but the U.S. needs that tablet PC right now, and not just for kids in developing nations, but here in the U.S., especially in impoverished areas of the country like the inner cities. It is impressive that the XO3, which costs $172, but Mr. Negroponte promised that it would roll out at $100, so why should anyone believe him again? I seem to recall this boast several years ago. There were several delays before the XO3 finally came out, but I have never seen one in any store. Computer components have really come down, but 2012 is a long ways off. I would be more of a believer if Negroponte had an actual working prototype, then I would be impressed. There are actually 50 top venture capital blog posts, but below are the top 15. These are all excellent venture capital blog posts. If you want to read the other 35 click on the link at the end of this article. "Without a bigger sense of purpose, it is hard to be an entrepreneur and stick through the inevitable tough times that will come your way." Discusses the repurcussions of accessible data and the necessity of transparency with your Board of Directors. Trend to watch for in 2010: Social Gaming, this article tells you why. Levine recommends taking the steps included in his blog article to boost the economy and create jobs. What defines the success of a community and how can we predict this? An inside peak into VC email response. VC Bill Gurley takes readers through an overview of the ups and downs of 2009. If VC Paul Graham could tell startups 13 things, these would be them. Innovation isn't dependent upon finance. Advice on putting the phone down, and paying attention at board meetings. This vlog teaches new entreprenuers what metrics really matter in the early stages of their development. A quarterly overview on VC funds raised from Q3 2007 - Q3 2009. $750 million of the $1.6 billion raised went to Khosla ventures. A successful exit for a small social media startup; FriendFeed was purchased in August 2009 for $50 million. Highlights the payout for initial investors. Highlights included 3 venture-backed IPOs in Q3 2009, an expanding start-up world and the reduced cash required to start companies. Announcing a new $300 million fund for technology startups. Investing between $50,000 and $50 million, this blog post outlines EXACTLY Andreessen Horowitz's requirements. Stem cell companies have attracted considerable interest in 2009, following Barack Obama’s lifting of George Bush's ban on embryonic stem cell funding, raising speculation that venture dollars will pick up in the sector. EndGenitor Technologies Inc. of Indianapolis, raised $2.5 million in Series C financing in July. Hadar Ron, managing partner at Israel HealthCare Ventures, and his firm have already been involved in the space since leading the $16 million Series D round for Gamida Cell Ltd. of Jerusalem in 2006. Gamida is using cord-derived blood cells as bone marrow grafts for patients with leukemia and may become one of the first stem cell companies to reach the market. Yael Margolin, chief executive of Gamida, said that it can be a challenge for companies to operate in the space, where the technology is newer and less proven than other life science sectors, but he believes the recent policy change in the U.S. will help it shine. Ron, whose firm last raised a $140 million second fund in 2006, and Margolin provided answers to a few questions on the state of the stem cell market. What are the differences between adult stem cell treatments and embryonic ones? Which one is further advanced? Margolin: Embryonic stem cells are a very interesting field, but it’s still a very early stage. But with adult stem cells, we expect several products to come in to the market soon, including Gamida. So with adult stem cells, it is not futuristic anymore. Our product, StemEx, we plan to launch in 2011. Ron: At the end of the day, what we are really focused on as investors is science that can turn into real treatments for patients. With the involvement of science, stem cell therapies are becoming a real source of treatments. What is the funding environment like for stem cell therapy companies? And what sets Gamida Cell apart from other stem cell start-ups? Margolin: I think the funding in this industry is a challenge, but at least in Israel the government is quite generous to early-stage companies. As for cell therapy, it is still considered a higher risk by investors than, say, small molecules. Ron: Compared to technologies where you feel more on terra firma, when you talk about cell therapies, investors are unclear on what path it’s going to take. At least with bone marrow, the science is understood, so there is a balance. Margolin: Scientists have been using bone marrow for 60 years, cord blood has been used clinically for 20 years. There is a lot less risk here. What Gamida Cell is doing is an option for using cord blood for adults. What we are developing is an alternative for bone marrow transplants, and we are the only company in that space in advanced clinical trials. Even though the Bush-era ban only affected U.S. government funding on embryonic stem cells, it clearly hampered stem cell research in general. How do you think the Obama administration’s new policy will affect stem cell investing, especially in companies like Gamida? Margolin: There has never been a total ban on research or stem cells in the U.S. or anywhere. But in terms of the atmosphere, the fact that the Obama administration changed the regulations has created a renewed hype in the field. Ron: I agree. I think there will be a change in atmosphere. I also think investors often don’t see the difference between embryonic and adult stem cells. Margolin: Yes, I think a lot of investors are not very educated on the various subtleties in stem cells. Will you continue to look at stem cell companies? Ron: We’ve already done one deal in the space, and it is doing well. Of course we will look at more. For the uninitiated, adult stem cells are undifferentiated cells, found throughout the body after embryonic development, that multiply by cell division to replenish dying cells and regenerate damaged tissues. Also known as somatic stem cells (from Greek Σωματικóς, meaning of the body), they can be found in juvenile as well as adult animals and humans. Scientific interest in adult stem cells has centered on their ability to divide or self-renew indefinitely, and generate all the cell types of the organ from which they originate, potentially regenerating the entire organ from a few cells. Unlike embryonic stem cells, the use of adult stem cells in research and therapy is not considered to be controversial as they are derived from adult tissue samples rather than destroyed human embryos. Here's a great video produced by NOVA for PBS on the subject of breakthroughs in stem cell research. Well worth viewing. I am glad that the Obama administration has lifted stem cell restrictions, which were driven by religious beliefs rather than science. I was appalled when research on embryonic stem cells was nearly halted during the Bush administration, because this effectively dried-up funding for stem cell research startups and setback the US' llead in this sector by at least a decade. 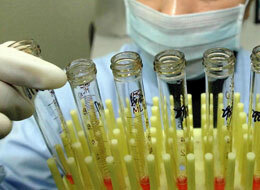 Stem cell research scientists went overseas, where they were able to conduct stem cell research free of restrictions. Breakthrough in stem cell research include repairing spinal cord injuries and regenerating heart muscle tissues. Stem cell research is till in the very early stages, but the potential is unlimited. Wikipedia has an excellent post on the topic of stem cells. Some of the worst defeats for newspapers in 2009 came in online advertising. Although a relatively small part of the business, the industry posted smaller percentage revenue declines than print ads. Newspapers' losses revealed the hollowness of preceding years double-digit growth, which were built almost entirely on online classifieds chained to print listings and supported by a bubble economy. In the middle years of this decade, newspaper publishers proudly pointed to quarterly year-over-year growth rates of 30% to 40% in online revenues -- matching, and at times even exceeding, the growth rate of online advertising in general. As print revenues peaked and began to decline in 2005-2006, online revenues became the all-important bright spot on newspaper ledgers. They were the good news that publishers could cite in their quarterly earnings results to take the sting out of the ominous trend in print. But this expansion would prove unsustainable: From an annual growth rate of 31.5% in 2006, newspapers' online revenues slipped to an 18.8% growth rate in 2007 followed by a 1.8% decline in 2008, while online revenue in the first three quarters of 2009 declined 15.5% compared to the same period in 2008, according to the Newspaper Association of America. This compares with general Internet advertising growth rates of 35% in 2006, 25% in 2007, 10.6% in 2008, and a modest 5% decline in the first three quarters of 2009, per the Interactive Advertising Bureau. Newspapers' online revenues were vulnerable for several reasons. First, they were concentrated in online classifieds, which were even more dependent on the health of the broader economy than search and display. The collapse of the real estate, automobile and job markets from 2006-2009 systematically gutted all three of the main classified revenue streams. Second, online classified sales never became independent of newspapers' print product. Most of the online business was based on "up-sells" from print listings, so the implosion of the print business took the online business with it. Other types of Internet advertising -- including search and display -- have failed to deliver substantial ad revenues for most newspaper publishers, even as online audience figures grew to enviable heights. Between the first three quarters of 2007 and the first three quarters of 2009, newspaper online revenues declined 14.5% while the total audience of newspaper Web sites increased 31% (from 23.5 billion page views to 30.8 billion). Acknowledging their failure to monetize large audiences through advertising, some newspaper publishers have recently indicated that they intend to start charging online visitors directly for at least some kinds of content. But analysts who follow the newspaper business are skeptical. Last month, Fitch Ratings warned that only a few industry leaders, like The Wall Street Journal and The New York Times, have a reasonable hope of succeeding with this strategy. In areas such as national, international, business and entertainment, news content has become commoditized, with the majority of metro dailies offering content so similar that readers don't feel a need to pay for it. Thus, Fitch expects most newspapers that experiment with pay walls will reverse course after seeing online audiences dwindle. That's especially true since other news outlets are likely to continue offering their content for free. COMMENTARY: It's been a tough slog for the nation's newspapers, and the same fate has occurred to print publications, with many memorable magazines succumming to the recession in 2009. Rising newspaper printing costs (remember when it cost 25 cents for a newspaper, now its 75 cents), and the growing trend by readers to rely more on the Internet for their daily news and information, has been the death knell for the newspaper industry. The cost-benefit is much higher online than offline, and the difficulty of most newspapers to monetize online content after the financial meltdown was the key reason why online advertising has stalled.